Since World War II, support from all levels of government has constituted from almost 50% of total spending on higher education. This has allowed governments to manipulate higher education to pursue alleged labor market economic needs and fashionable political objectives. The resulting political conflict has bred turmoil and chaos within an educational community obsequiously scrambling after governmental largess. Assembling a methodical examination of governments pervasive involvement in higher education and academic research, eleven distinguished scholars show that the real beneficiaries are middle- and upper-income students and the educational establishment itself; in contrast, the rest of societyespecially the poorare exploited to provide the benefits. Widespread symptoms of academic decay are traced to perverse incentives offered those within the bureaucracies of contemporary higher education. The analysis in this book is more than nostalgia for the good old days. Instead, it makes a powerful argument that meaningful reform of higher education will never be successful until battle is waged against the modern government-university complex. Foreword: Higher EducationState of the Art or Art of the State? Chapter 2: Higher Education in Service to the State? Since World War II, the support from all levels of government has ranged between 45 and 50 percent of higher education's total revenues. In 1983, 73.2 percent of all full-time college students were in government institutions. Ironically, private colleges and universities receive 44 percent of the federal dollars spent on higher education. Hence, the federal subsidy per student is greater at private than public institutions. Military motivations have played and continue to play a major role in the federal government's support for higher education. When the federal government established land-grant agricultural colleges during the Civil War, under the Morrill Act of 1862, military training was incorporated into the act. As a result of World War I, the federal government began awarding research contracts to universities. The National Defense Education Act of 1958, passed during the Sputnik scare, established the student loan program. Today the largest category of federal financial support to higher education is student aid, which in 1985 amounted to $10.3 billion or 47.4 percent of total Federal expenditures on colleges and universities. Moreover, this figure only captures the overhead costs of guaranteed loans, and not the volume of such loans. In 1989 for example, the guaranteed-student loan appropriation was $4.1 billion, although the actual loan volume was $10.9 billion. The Reagan Administration, despite anti-Department of Education rhetoric, made no cuts in student aid. Appropriations under the Higher Education Act in fact increased from $6.34 billion in fiscal year 1981 to $8.2 in 1987. Even after adjusting for inflation, they still rose, in constant 1982 dollars, from $6.88 billion in 1981 to $7.04 billion in 1987. Most college students in the U.S. would go to college even without subsidies and they would receive better educations. The reason is that the demand for college education is very inelastic, and if state colleges were eliminated completely, it would probably fall by far less than 25 percent. But the existence of tax-supported state colleges and universities attracts many students who would otherwise pay for higher quality, more efficient, private educations. The overhead cost of collecting tax dollars for higher education is somewhere between 50 cents and $1 for every $1 collected. This amount is a total deadweight loss to society. Today the poorest quartile of the population is under-represented among those attending colleges and universities. In other words, government support benefits wealthy and middle income students at the expense of the poor who do not pursue a higher education. A major reason for the decline in the quality of higher education is the desire of the educational bureaucracy to keep government aid flowing. With the college-age population in the U.S. dropping by nearly 15 percent since 1977, colleges and universities have admitted ever greater numbers of less qualified students. Every year since World War II over half the support for basic research in the U.S. has come from the federal government. Yet government-sponsored science and technology actually retards technological and economic progress. The rationale for such subsidies is that the market will not allegedly produce enough theoretical research because individuals cannot profit from the social benefits of their research. But political rent seeking and bureaucratic allocation through government misallocates grants to programs that foster immediate benefits and that would be profitable anyway. The inferior education that Americas college students are receiving makes regular headlines. Yet when one thinks of government schools, primary and secondary education are what immediately come to mind. The States dominance over these levels of schooling has occasioned the most intense criticism and the most fertile search for market-oriented alternatives. We sometimes overlook the government's equally immense involvement in higher education. Now a new Independent Institute book directs a piercing beacon at government's pervasive role in colleges and universities. 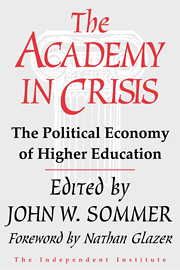 Entitled The Academy in Crisis: The Political Economy of Higher Education, the volume is edited by John W. Sommer, former Deputy Director of Science Resources Studies for the National Science Foundation and Knight Distinguished Professor, University of North Carolina, Charlotte. Nathan Glazer, Professor of Sociology and Education at Harvard University provides the books foreword. The book enlists thirteen scholars in economics, education, statistics, literature, political science, law, demography, and geography. Their collective professional experience includes not only college and university teaching, but administration, business, research, the military, and government service. Thus during the Civil War, when the Union established the land-grant agriculture colleges through the Morrill Act of 1862, it was merely carrying on and expanding upon a well-established policy. By World War I the federal government was awarding research contracts to universities. And since the end of World War II, support from all levels of government has hovered between 45 and 50 percent of higher education's total revenues. The books second chapter, by Joel Spring (State University of New York, New Paltz), explores further the political and economic ramifications of this massive support. Springs major finding is that from the time of the Morrill Act, the federal government has manipulated higher education to serve both what it believes to be the labor market's economic needs and whatever political objectives happen to be currently fashionable. The resulting political conflict has bred turmoil and chaos within an educational community obsequiously scrambling after the State's largess. Today the largest category of federal financial support to higher education is student aid, amounting to $10.3 billion or 47.4 percent of total Federal expenditures for colleges and universities even as far back as in fiscal year 1985. Moreover, this figure only captures the overhead costs of guaranteed loans, and not the overall volume of such loans. C. Ronald Kimberling, a former Assistant Secretary for Postsecondary Education in the U.S. Department of Education, contributes to The Academy in Crisis a detailed analysis and critique of this program. Kimberling reveals that the Reagan Administration, despite anti-Department of Education rhetoric, made no cuts in student aid. Appropriations under the Higher Education Act increased from $6.34 billion in fiscal year 1981 to $8.2 in fiscal year 1987. Even after adjusting for inflation, the numbers still rose. Indeed, the popular perception that student aid has fallen is the result of Congresss pusillanimous refusal to go along with a Reagan Administration reform that would have concentrated Pell grant awards among low-income students. Because Congress actually enacted the reverse, enhancing the eligibility of middle and upper-income students, the size of individual grants was diluted. With college costs rising faster than total grants, and with Congress making ever more students eligible, the average grant size, to poor and wealthy alike, shrunk. Rounding off the books opening section is a chapter by Anthony Flew (University of Reading). Rather than focusing upon the external politicization of the academy through the States pervasive influence, Flew exposes internal politicization. He sees the eclipse of the traditional liberal and humane curriculum, the increasing political radicalization of the faculty, the decline of academic standards, the philosophical denial of objective truth, and the faddish incorporation of special interest courses and topics as all part of the same general syndrome of internal corruption. Flew thinks that educational reform ultimately requires moral reform from within colleges and universities themselves. Edwin G. West (Carleton University) thoroughly dissects all justifications for government support of higher education. 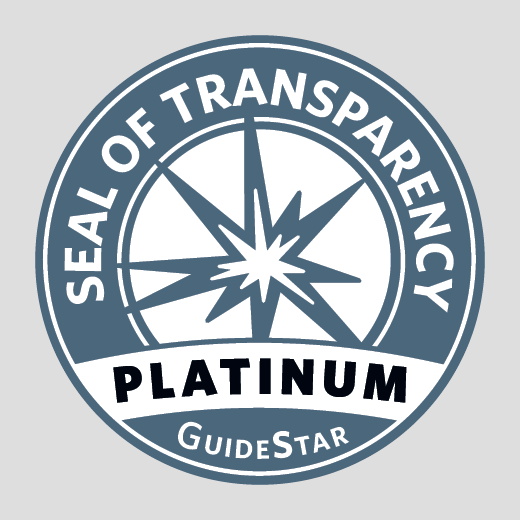 These justifications usually rest upon cost-benefit calculations. But with empirical data from Canada, where West teaches, he shows that studies often understate the costs of public support significantly. After careful scrutiny, West concludes that the real beneficiaries of the States subsidization of higher education are middle and upper-income students, and the educational establishment itself. He demonstrates through public-choice economics that it is the political rent seeking of these groups, who successfully exploit the rest of society, including the poor, that best explains the State's ongoing academic enthusiasm. The externalities argument also surface in the chapter on academic research by Stephen Dresch (Michigan Technological University). The most popular explanation for State funding of this research is instrumental; fundamental research purportedly leads to technological innovations that in turn lead to economic growth. Dresch finds this justification hopelessly vague and confused. The inadequacy of the prevailing economics of fundamental research is the failure to identify what it is that research contributes to society. The defenders of State funding are at last resort reduced to defending fundamental research as an end in itself. But by turning academic research into another artistic form of consumption, they knock out all utilitarian props for State funding. Roger Meiners, along with Robert J. Staaf (Clemson University), contribute the final chapter in the books second section. It is a stimulating and innovative property rights analysis of institutions of higher learning. Why do professors devote more energy to writing and research than teaching? And did you ever wonder what explains the labyrinth of academic politics? Rather than just denounce these and other modern symptoms of academic decay, Meiners and Staaf show how they are the predictable outcome of the perverse incentive structures in non-profit, non-proprietary colleges and universities. Universities and colleges are more than just educational institutions. Government intervention has turned them into sources of scientific and technological innovation. Indeed, as Sommer points out in his introduction for The Academy in Crisis, over the past half century, universities have replaced industry as the chief place of conduct of this research. Meanwhile, federal and state governments became the chief provider of resources for this research. As Joseph Martino (University of Dayton Research Institute) puts it in his chapter, since World War II, it has been taken for granted that science and technology deserve public support. An enormously influential book first published in 1945, Science, the Endless Frontier by Vannevar Bush has been the primary source of this automatic presupposition. But the four chapters that constitute the book's final section raise some serious questions about this presuposition's tenability. Peter H. Aranson (Emory University) demonstrates that the same public choice dynamics so devastating for other forms of government intervention are at work with respect to science and technology. The only technological intervention with any potential social benefits is patents. Martinos chapter, after exhaustively combing through all the empirical research on the economic benefits of research and innovation, discovers that the State still runs headlong into insurmountable information problems. There is no way it can rationally determine how much science and technology should be subsidized or where those subsidies should be directed. Cotton M. Lindsay (Clemson University) takes on the glib assertion of the National Science Board that the numbers of mathematicians, engineers, and scientists may fall below national needs without public support for their education. He finds the argument riddled with economic fallacies and slipshod reasoning. Allan Blooms The Closing of the American Mind made the trashing of American higher education a growth sector in the intellectual marketplace. But The Academy in Crisis shows that the problem runs deeper than nostalgia for the good old days. It is the State that determines the contours of higher learning in this country. Reform of our colleges and universities will never be successful until it finally does battle with the entrenched, bureaucratic, government-university complex. John W. Sommer is Knight Distinguished Professor Emeritus at the University of North Carolina at Charlotte.